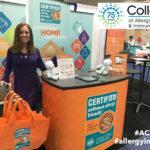 November 2017, Denver, Colorado From November 3rd to 5th, Michele Cassalia, Director of the asthma & allergy friendly®® Certification Program in the USA, attended the 2017 Food Allergy Bloggers Conference (FAB) in Denver, Colorado. The objective was to spread the word out about the asthma & allergy friendly®® certification program to a new audience of online bloggers and influencers. What is the FAB Conference? The FAB conference is a unique conference that brings together allergy bloggers with advocates, medical professionals, and companies specialised in supporting allergy living and safety. The event is organised around different panel discussions focused on disease management and blogging information. The attendees had the opportunity to learn from experts, such as Michele Cassalia, on how to prevent allergies so that they can then share this knowledge with their subscribers and communities. Michele Cassalia was delighted to be able to meet with these bloggers, educate them on the issue and generate awareness of certified products for a healthier home. The bloggers she met showed a keen interest in our certification program as products that earned the certification have passed rigorous scientific tests and are deemed a healthier choice for people impacted with asthma and allergies. Bloggers that met with Michele were delighted to find out about the Certification Program mobile app we developed. The app allows consumers to find products that have passed our standards and certified asthma & allergy friendly®®. The app was recognised as a very useful tool for consumers regularly affected by asthma and allergy issues. Bloggers were extremely interested about our certification program and were keen to engage with their communities about it. Growing our community on social media and sharing stories about people who are using products that have been certified will be very important in the future to generate awareness among consumers. HAVE YOUR HEARD ABOUT OUR APP? This new app compiles all products and services that have been certified by our Certification Program and that have been proven to meet the highest standards. THE AMERICAN COLLEGE OF ALLERGY, ASTHMA & IMMUNOLOGY ANNUAL SCIENTIFIC MEETING This year again our asthma & allergy friendly® certification program was strongly featured throughout the exhibition hall at the Annual Scientific Meeting organised by the American College of Allergy, Asthma and Immunology (ACAAI).